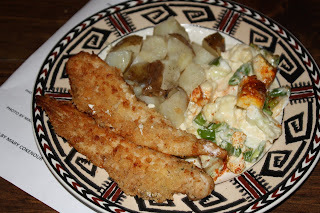 Food Adventures of a Comfort Cook: Simply Fried Fish and the bountiful veggies mutiny. Simply Fried Fish and the bountiful veggies mutiny. While shopping, I was lucky to come upon Whiting ( a mild white fish) in the frozen fish section; remember now, I live at the end of the world, so fresh fish isn't available often, if at all. Now when I lived back East, we would always buy whole fresh Whiting and bake it; the meat of this fish is so sweet and succulent. The side dish served with it was my grandmother's potatoes which were similiar to hot German potato salad. 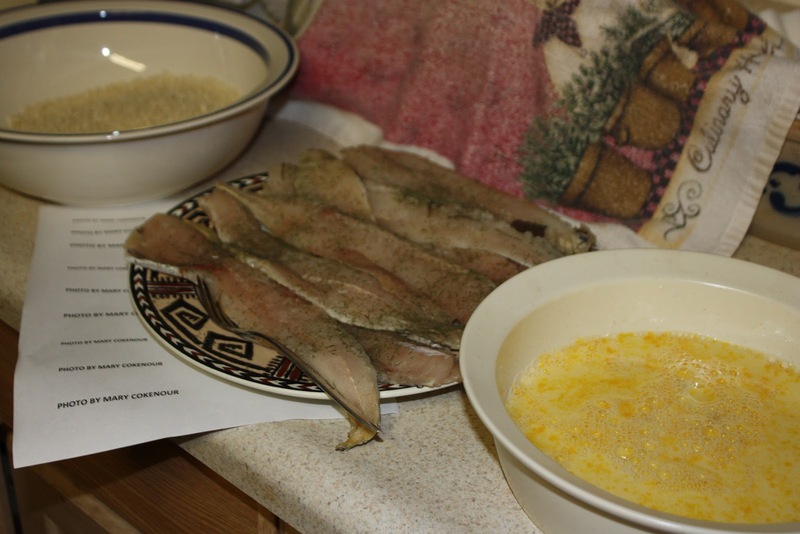 However, since the frozen fish were filets, I decided that frying them would be a better justice for them. In the above photo you'll see the fish dredging station I set up. 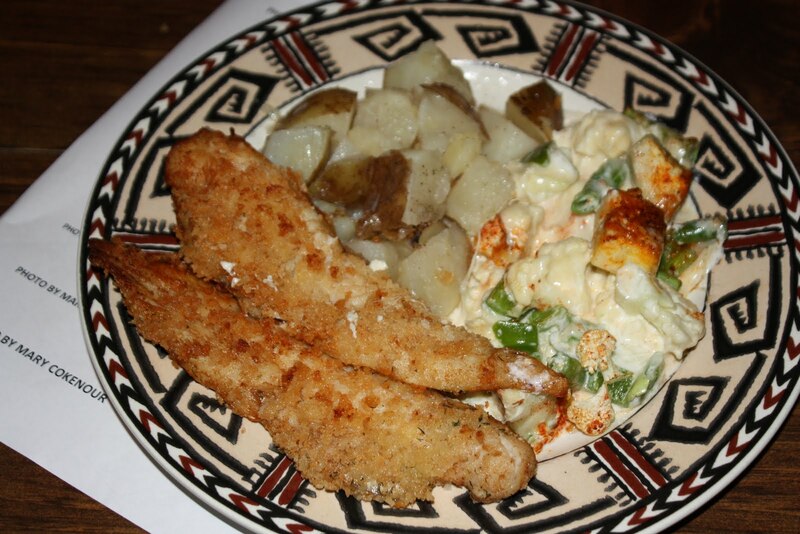 The blue rimmed bowl contains Panko (Japanese bread crumbs), the plate is the 2 lbs of Whiting seasoned with salt and crushed dill, and the white bowl contains a mixture of 2 eggs mixed with a cup of whole milk. There were 9 pieces of fish altogether, so I planned on frying 3 at a time. On the stove, I had 2 cups of peanut oil heating up on medium-high heat. The simple process was to soak 3 fish filets in the egg/milk mixture until the oil was hot enough to fry in (a flick of cold water into the skillet made the oil begin to sizzle). I then placed each filet into the Panko, making sure to press it into each side of the filets and then slide them into the hot oil. I let them fry for 3 minutes on each side before removing to a paper towel covered plate to drain the excess oil. Also, while the first 3 were frying, I had the next 3 filets soaking in the egg/milk mixture, and I just repeated the whole process for the remaining 6 filets. Simple done fried fish with a crispy crust, but moist, flaky flesh. So where does the bounty of veggies come into play? It all started before I began frying up the fish of course. One of Roy's coworkers had an excess bounty of veggies from her garden and Roy brought some home...green bell peppers, banana peppers, eggplant, green beans; and I just happened to have a head of cauliflower in the fridge....Evil Vegetable Gratin!!!. Cutting all the veggies up into bite sized pieces, mixing with the cheeses and other listed ingredients from the recipe; it was placed in the oven and timed to be ready at the same time as the fried fish. My grandmother's potatoes is another simply made dish: boiled potatoes cut into chunks or slices (your choice - leave the skin on! ), mix in a bowl with olive oil, red wine vinegar, ground black pepper and salt. I'm not putting any measurements here because it is all according to taste. I like the tang of the vinegar and snap of sea salt, so add more than someone else might. Comfort cooking can be simple or it can be complex; it's all up to the cook in the kitchen.